Sarouk is the name of a small village nestled in the mountains of Iran's massive interior. In the late 19th and early 20th centuries it produced some of the finest room-sized carpets for the international market, and today the tiny village lends its name to the enormous quantity rugs produced in its general vicinity during the Persian rug-making renaissance. It had been a region with a long weaving tradition to begin with, both tribal and urban, and when the international market fueled new demand for rugs in the 19th century, Sarouk, along with its neighbor, Arak, found itself positioned to take advantage. These two anchor towns, but also the dozens of villages extending into the countryside, drew on a bedrock of local experience and easy access to fine wools and dyes to weave large volumes of exceptional rugs for export. 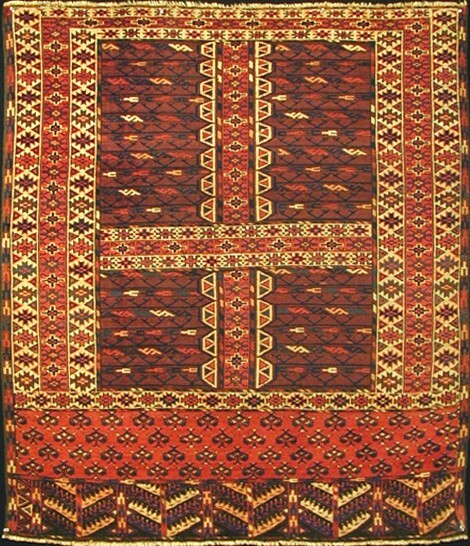 Within the general Sarouk category, some superlative examples do stand out, most notably the Farahan Sarouks of the 19th century. These elegant carpets are considered to be some of the finest of the entire rug-making renaissance, and typically are classified under their more specific name, Farahan Sarouk. But the broader category is famous in its own right for denoting the exceptionally large, heavy-bodied, thick-piled, and richly-dyed carpets of the region—qualities not coincidentally favored by 19th century dealers in New York. This relationship between America and Sarouk cannot be overstated. While some of the rugs made their way to Europe, most were sold to New York, and New York, in turn, profoundly influenced Sarouk’s most famous designs. 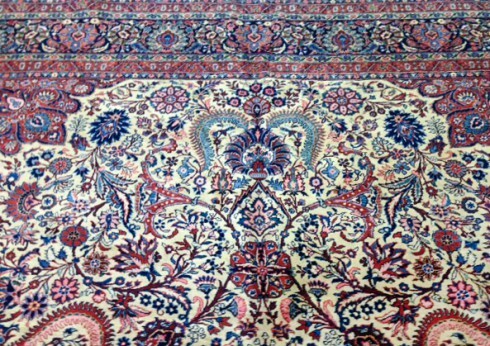 Dealers wanted classical Persian rugs, and Sarouks, in response, came to be adamantly traditional carpets. Their designs take the form of classical Persian floral motifs, and few stray far from the original palace carpet models on which they are based. Even colors were dictated by the market: New York dealers, believing that the original soft, mellowed dyes of the Sarouks were their only commercial drawback, created a post-production, natural dying process to enhance the rugs once they reached the states. The process resulted is a deep, hyper-saturated red color with which Sarouk rugs became nearly synonymous. 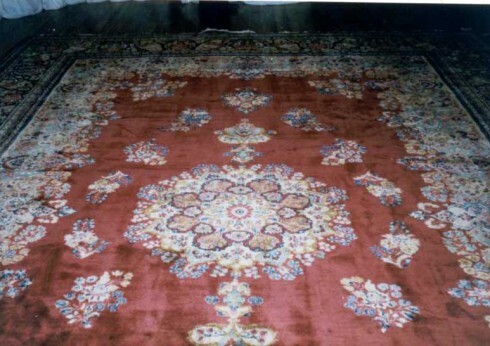 Sarouk carpets, constructed in a very real sense for the American home, are made to be exceptionally durable. The market required that they withstand heavy foot traffic and daily use, and they lived up to the challenge. Decades-old examples show minimal wear, even in color, a testament to the remarkable tensile and abrasive strength of high quality wool and the tight Persian knot with which Sarouk rugs are woven. For toughness, they are typically constructed on thick cotton warps with heavy, luxurious wool pile tightly knotted. The Sarouk region continues to produce carpets today, and for the most part has stayed true to its original weaving and dying traditions. The exception to this, of course, is the post-production dye job, a hallmark of antique Sarouks that ended around the First World War. Both the antique Sarouk rugs and more recent vintage examples are, and have always been best-sellers, perennial favorites of consumers looking for decorative, exceptionally well-made carpets for daily use in the home.